It's a bar in the middle of a lake! Oh yeah and...it's very, very haunted. 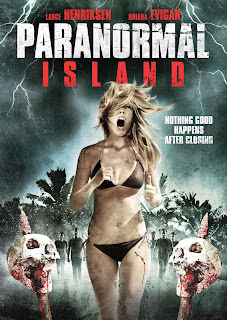 Claiming that "Nothing good happens after closing," the Lance Henriksen/Briana Evigan slasher film, Paranormal Island is being released on DVD and Digital HD on September 1 from Cinedigm and VMI. Touted as Paranormal Activity meets Evil Dead, Paranormal Island marks the directorial debut of Marty Murray and in addition to Henriksen and Evigan, features Randy Wayne and Ben Elliot. When three college kids take a summer job it’s a chance of a lifetime to bartend at a bar in the middle of a lake! The bar has been around for over a hundred years and is presumed by many locals to be haunted, after the owner killed himself many years before. Unfortunately they miss the last boat off the island and are stuck trying to find a way off. As darkness falls, they quickly realize things are very different after hours as they are hunted by the paranormal caretaker.